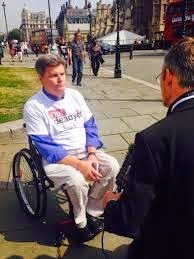 Euthanasia Prevention Coalition Euthanasia Prevention Coalition: Dying with dignity – really? Spokesperson/Convener of the Not Dead Yet UK Campaign. Death is not an event in life, like marriage, or buying your first car or home, not even like losing a limb. It is not a catastrophe to be ‘cured’ or fixed or accommodated going forward. Death is the end of all the possibilities of life. It is both more terrible and more important than injuries suffered in a car accident, or the suffering a cancer brings. We have lost that sense of its importance. We live in a time when we are constantly bombarded by atrocities from across the globe. We say ‘life is cheap’ when what we really mean is that death is, when our sense of what it is for a human being, any human being, to die, is corrupted beyond repair. We have lost any sense of the ‘terrible beauty’ that Leon and Jill Uris photographed in Ireland in the 1970s, that even in such horrific and deadly circumstances there can still be something there for us to find profound, even beautiful. We only count death now as a degrading ‘failure’, as though we can and should be able to defeat it, if we only worked a little harder, did a bit more research. Death has become the cheapest of all commodities and dying is our new atrocity in western, wealthy cultures where the luxury of false ‘choice’ exists. Dying has become an abomination, in which we are supposed to be absolutely and irrevocably excluded from the new alchemists’ panacea…dignity. So Brittany Maynard, faced with dying in a way she found unacceptable, has committed suicide with the help of the state of Oregon. There are so many questions left unresolved by her final act – would there have been any kind of dying she might have found acceptable? is it really so simple ‘Her life her choice?’ are there no concerns about how she has used her dying to promote a cause? But my question here is not ‘Whose life is it anyway?’ – that question is a false one – oh, it looks like a question , has all the words in the right order - but it is actually nonsensical. Any part of this debate focusing on her ‘right’ to do this is specious, and no help whatsoever. No, my question is ‘Whose dignity is it?’ I have lived for more than forty years with indignity after indignity – like the apoplectic railway worker screaming at me at 6 in the morning that my wheelchair was too big for the train carriage. Did he upset me? For sure. Did I lose my dignity? Well, actually, not that time. I kept my composure, my dignity. So whose indignity was it? His. My wheelchair is a standard, relatively-compact size, like the majority. His fury was entirely disproportionate, blaming me/my ‘chair was stupid and he was certainly not fit for his job in that moment. Do I deny that sometimes I let my dignity slip in face of the next, accumulative ‘insult’ that life throws at me? Far from it, I am human, and occasionally my responses are out of line with my desire to maintain my dignity – but that’s the point: when I regain my dignity I realise it was mine to lose, to give away. It is not someone else’s actions that can take my dignity from me; only I can give it up. Now I would never dare to say this is easy: it is not. It is hard, and will get harder. And I do not, cannot condemn others, like Maynard, who reach a different personal decision. I am not in any way claiming to be ‘holier than thou’ or her. But what I can and do condemn her for is trailing her dying through this media circus. I do condemn her for imposing her decision onto others – those with the same condition some of whom feel they must write in reply to her media story that they do not share her feelings, her approach to this disease in themselves, people with far less love around them, vulnerable to suggestion for reasons of exhaustion or fear, or money or even something like an intellectual impairment – people who will be told ‘If Maynard can, so can you’. That is an enormous and terrible legacy she is leaving. I am, despite what I do, a very private person. I give up stories and information about myself with the deepest reluctance. I would like nothing better than that no-one but my closest and dearest knew anything about my personal challenges. But we live in an era where information is prostituted at every turn on a phenomenon called the Internet. There is really no such thing as ‘privacy’ any more, at least not as I grew up with it – yet privacy is an essential element of living with dignity. It is that moment, one of millions, when the nurse makes sure that the curtains around your hospital bed are properly closed. It is that moment you spend with your mother, when she looks at you and you both know it’s the last time you will ‘see’ each other as she slips into coma, and away from this life with all the grace and dignity of a fitting and appropriate end. What Maynard chose to do, privately personally, still brings me lots of unanswered questions. But on a human level, do I understand how she can get there? Of course. Can I still wish for her that she hadn’t felt any pressure to think this way? Of course. And isn’t it ironic that what contributed some of the pressure on her was just exactly that others like her go around saying what she was saying herself? Of course. If everyone went around instead saying, we now will provide you with every humanly available support and resource to help you through, would she have coped better with her fear, dealt with some of the oppressive symptoms, maybe change her view that the end of her life might after all be as important as life itself, and not just for the message it sends? If she had found a different response might she have inspired a thousand others to cope better? Is despair the only valid response? My answer has to be categorically ‘No’. But I am not here preaching to the Maynards of this world that my way is right, the only way – but why then should she preach to me and the world, that hers is? It is a perverse moment of ‘immortality’ that her story will continue – there are organisations which will ensure that – to affect many people so negatively, to contemplate and commit suicide as she did. I repeat, I do not find this counsel of despair dignified at all – I do not for a second buy the idea that committing suicide can ever be generally and so easily counted as ‘more dignified’. Giving in to despair is an understandable part of the human condition but I cannot accept that the only way any of us can die with dignity is to follow Maynard to Oregon. Millions of people die across the world every year: the media reports the tiniest number, like Maynard, who put their stories into the public domain claiming they alone are dying with dignity – really? Thank you. I thought maybe I was going insane trying to defend that suited is not right. Thank you for explaining so well what I wanted to explain.